A hare paced around the pasture field as I walked up to the wood. I don’t think I’ve seen one here before so I took it as a good omen. As I crested the top of the hill I disturbed a flock of (I think) lesser black-backed gulls. Odd to see them here in Bedfordshire, miles away from the sea, but apparently they are the most inland of all the gulls. I was keen to see the badgers at the main sett. Partly because I haven’t had time to get up to the wood lately, and I need to watch badgers. It’s what I do. It’s my identity. ‘Dead-Polecat-Picking-Up-Man’ doesn’t have quite the same ring to it! More seriously, we’ve had three weeks of hot, dry weather. This isn’t great for badgers as it makes earthworms harder to catch, so prolonged dry spells can put them under pressure to find enough food. And to be honest, I haven’t really got a handle on the badgers this year. In previous years they followed a broadly predictable pattern – cubs, social groups, mutual play and so on. Maybe it’s because I haven’t spent as much time with them, but I have only seen mostly single badgers with none of the social behaviour I’ve got used to. A couple of years ago I could count 12 badgers at this sett. This year the most I’ve seen is 4, and that was in March. I’ve seen no cubs. Either they’re staying hidden or the group is a lot smaller this year. Whatever. That’s the bigger picture. To be honest it was nice to sit in a tree on a warm evening and listen to a woodpecker yaffling somewhere close by and the sheep bleating in the field. At 8.20pm I heard faint sounds of badgers whickering and playing at the east end of the sett. This was good. 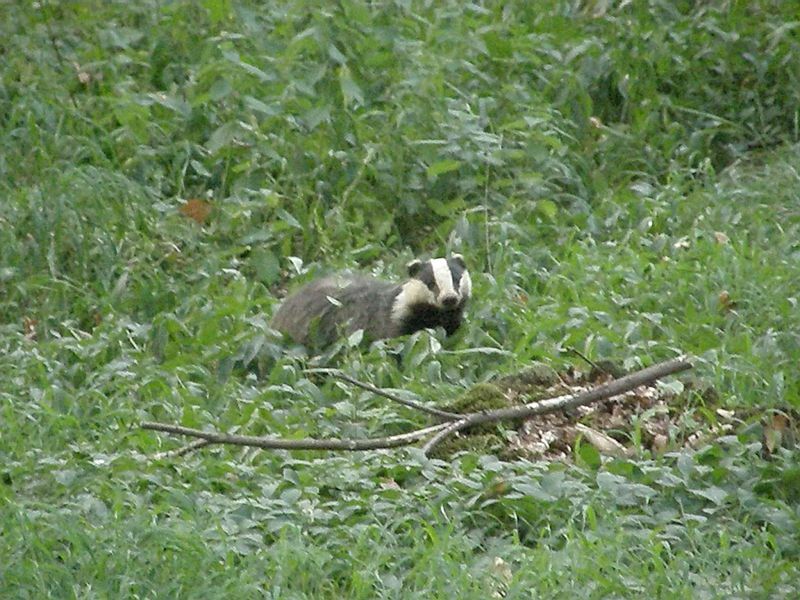 It meant that there were at least two badgers and they were sufficiently happy to spend time and energy playing. Of course, I could see nothing through the undergrowth. I debated climbing down from my tree and trying to get closer, but there wasn’t really anywhere better to watch from. I stayed put. Badgers obviously drag the bedding backwards all the way down the sett to their sleeping chamber because they tend to come out with their fur brushed backwards, showing the paler underfur. By 9.15 the three badgers had ambled off deeper into the woods and I headed home myself. The badgers seemed happy and healthy and not particularly stressed, which was good. On the other hand, I only saw three of them. I’m starting to think that there are only three or four badgers at the sett at the moment, and no cubs. The sett hasn’t been disturbed, as far as I can tell, and I haven’t seen any dead badgers, so I don’t think they’ve met with any catastrophe. I’ll try and get to the wood one morning so I can have a good look round without disturbing the badgers and see if I can find anything that may explain their reduced numbers. I could be wrong, of course. It is notoriously difficult to count the number of badgers in a sett. I may see a dozen the next time I watch them. But I don’t think so. I think there really are much fewer of them this year. What can cause a sett of 12 badgers to reduce to 3 or 4 in a couple of years? Are they dead? Have they moved away? Perhaps I need to have a look at the neighbouring setts and see how they’re doing. Perhaps this mystery can only be solved by understanding the whole network of clans in the area, not simply by studying one clan on its own. Great footage of bedding collection! Thanks for sharing. Odd as it sounds, I never get tired of watching badgers collect bedding. There’s something strangely endearing about it. Love your blog too, by the way.